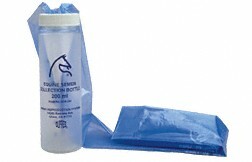 Convenient stallion collection kits include a 36-inch soft liner attached via screw-cap to a 200ml plastic bottle equipped with an ARS Nylon Mesh Gel Filter already in place. Order as each or packs of 5 per ziplock bag. Fits 18" or 22" Missouri AV.